Welcome to my fourth post in the building DVD Shelves Blog. By now you will have cut all of he materials and are excited about getting to the interesting part of the project where you start to see your DVD shelves come to life! This is a simple guide to the steps I took to assemble my DVD Shelves and any tips I might have along the way. So lets get started! The first thing you will want to do is assemble the riser box which site under the shelves. Once assembled you can also glue and screw it to the bottom site of the bottom shelf of the DVD Shelves. 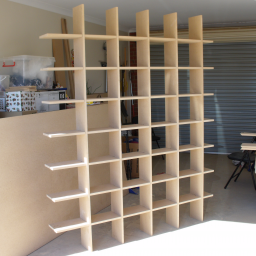 Next put together the shelves and uprights – WITHOUT GLUING THEM. This is an easy way to get the correct spacing for the uprights when you glue and screw them to the bottom shelf, and then the top shelf. If you have pretty tight tolerance on your slots in the shelves an uprights then the the whole assemble with stand up by itself. <== To the left is a picture of my DVD Shelves freestanding, not yet glued or screwed. Once you have screwed on the top and bottom shelves, it is time to remove each shelf (best done one at a time), apply glue and reinsert the shelf. Since you can’t really screw the shelves to the uprights I recommend using a good wood glue that will do the job for a long time to come! Next attach the side uprights. Next we attach the shelf backs. These serve two purposes. 1. the stop the DVDs from falling of the back of th shelf and keep them aligned at th front. and 2. the help to sure up the structure of the DVD shelves, forming a major part of the structural integrity of the DVD Shelves. Each backing strip should sit 15mm below the top of the shelf and 60 above the shelf. This gives you a way to glue and nail each piece to the shelves and the uprights and makes sure they don’t come lose with time. 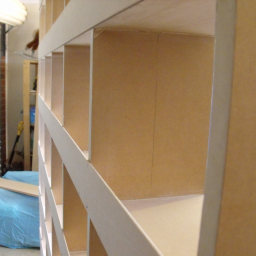 The idea is that the Shelf back form a nice back for the shelves, while leaving the back of the shelf open. Leaving the shelf open doesn’t make the whole structure seem very large and imposing against the wall. 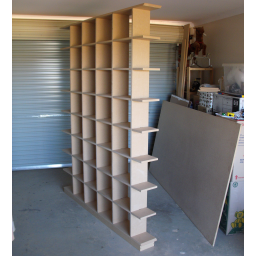 BORING WORK ALERT!… Once assembled, you will still have some gaps where the shelves meet the uprights – depending on how well you cut the slots. There may also be gaps at the front of the book case on each of the upright where they meets the shelves. Since we are going for a box look we need to make sure that when we paint the shelves there are no gaps. Tip: I didn’t worry about the back! Once I have filled all of the gaps, I let the filler dry and then sanded the WHOLE DVD Shelf! Even though the MDF has a nice smooth surface, I made sure that I sanded all of the shelves and all of the uprights so that there wasn’t any surfaces that my paint wouldn’t stick to or end up uneven on. Finally I painted the shelves. I gave my shelved two coats. I used a semi-gloss black, but you can paint yours any color you like, If you have a very white house you may choose to paint yours a gloss white for instance.